This blog is directed to customers of Moda fabrics and United Notions. However this post has information for Store Owners and Consumers as well, so I wanted to let you know that because some of the details in the videos maybe be confusing without a heads up. The moda designers will be having a month long blog hop beginning September 6th featuring a daily post and project from each of the participating designers. Each designer is featuring a fun make it and take style project that is inspired by the country fair theme. STORE OWNERS: The designers that attended spring market also designed quilt blocks for stores owners to use in their stores. If you were not able to attend the schoolhouse session featuring the quilt, please sign on to your customer workstation (via moda fabrics website) to download the information for the quilt. Look for this icon in the upper right hand corner of the customer web page. Only visible once you have signed in with your customer ID and password. Okay now that the explanations are over, let’s get down to the fun stuff. Look for these quilt blocks, patterns and recipes from the moda designers at your favorite retailer. 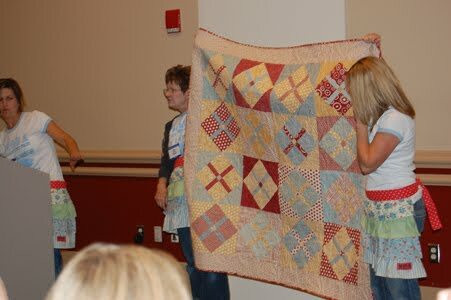 The quilt shown was a combination of several moda designers newest lines. Many of the shops have taken these designs and featured a variety of collections also. Pick your favorite block, make multiple blocks and have a completely different project. The possibilities are endless. September 15th Joanna from Fig Tree and Co.
September 19th Barbara Brackman from Barbara Brackman, of course. I’m wondering who it is that makes up URBAN CHIKS. Do they have a blog? Can you get them to participate in these blog hops? I’d love to ‘get to know them’! Cant wait for september 13! I’ll be sure to “hop” along with ya! Can’t wait to join in the fun! Let’s get “Hoppin”! I’m blogging about the Hop! woohoooo! I love blog hops! Count me in! Looks like great fun! Happy Blog Hopping to all! This is so exciting. Let the fun begin! Love visiting the blogs each day – great inspirations and creativity from all of you! Thanks! It seems that cabbages and roses site is not the blog fir today. It is a July posting. What am I doing wrong? I’m having the same problem as NannyS and agnespat. But the most recent blog post is dated July 18, 2011. I’ve emailed Christina at info@brandinginc.net and will post her reply when I get it. No new post for September 23…. I also cannot find the blog for 23rd September. My thought tonight is that we only have a short time left for the Moda Fair. I honestly have to say I had alot of fun with the designers of your fabric and their ideas of a country fair, and their questions. 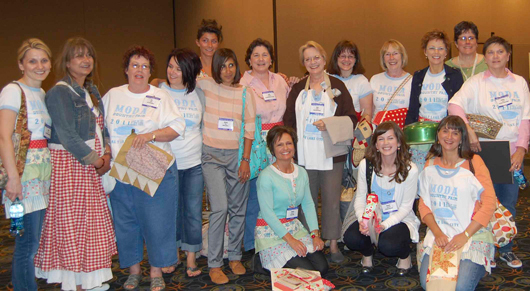 Thanks moda and to all the wonderful designers who took time to think of an entertaining fair, a great project to whip up and fantastic giveaways!! I LOVE Moda fabrics. I know and trust they are always the top best quality! Anyone else having problems finding today’s (29th Sept)blog? It has been a lot of fun learning about these designers. Thanks for arranging this. finding the updated blog or any blog for that matter for today….9/30??? Nothing wrong with me…duh….I’m a day ahead!! Sorry I inquired about the blog for the 30th! It’s only the 29th!! For heavens sake…..please excuse me while I blush. Sorry!! I am late to the Fair but dancing as fast as I can to see what the Designers have been doing. I am however intrigued about one thing…. 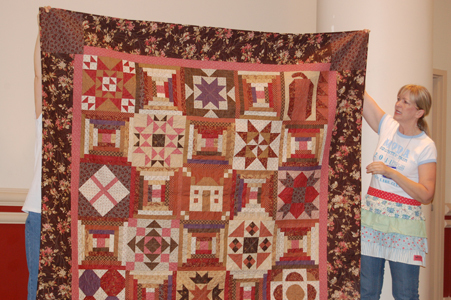 this lovely Baker’s Dozen (Country Fair) Quilt I see held up in the photo with the Courthouse Step setting…… I cannot find any further information about the pattern. Is there someone who could give me any assistance in this quilt pattern search? Has Lisa from Primitive Gatherings posted her winners somewhere, I too can’t find an updated post on her blog ??? Thank you for this web site post, I enjoyed its content and style. I came across this web site on Google and today have added it to my personal favourites features checklist. I will be sure to come once again quickly.